In March 1988, at the tender age of seventeen, I played the role of Eliza Doolittle in the school production of My Fair Lady. Perhaps this is where A Memory of Violets really began. I was captivated by the lives of the flower sellers in turn of the century London, and the seed of an idea began to grow. But it wasn’t until 2010, when I started researching the lives and backgrounds of the real ‘Elizas’, that I discovered the work of social researcher, Henry Mayhew. I was immediately fascinated by his transcribed interviews with London’s street sellers, but it was while reading the heart-breaking account of two orphan watercress sellers – sisters – that my heart leapt. I knew immediately it was their story I wanted to tell. Through further research, I stumbled across the work of the Victorian philanthropist, John Groom, a Christian preacher who tirelessly supported the watercress and flower sellers, and London’s orphans. Groom established an orphanage in Clacton on the south coast of England to give these abandoned children a better life. In Clerkenwell, London, he provided homes for the young woman who sold flowers on the streets and he taught them to make artificial flowers. Groom’s ‘flower girls’ as they were affectionately known, went on to make millions of roses for Queen Alexandra Rose Day in June, 1912, the first charitable event to raise funds through the sale of artificial flowers. The John Groom charity still operates today, under the name Liveability. Reading the history of Groom’s orphanage, his ‘crippleage’ and the lives of the blind and disabled women who produced artificial flowers for Queen Alexandra, was like discovering buried treasure. In 2012, I visited the London Metropolitan Archives, where a vast amount of information about John Groom and Alexandra Rose Day is held. It was incredible to see photographs of the young children at the orphanage in Clacton and of the girls and women in the flower workrooms in Clerkenwell. To see their handwriting on the simple postcards Groom produced to promote their work, to read accounts of their daily routine and their work, to walk the street where they’d lived, to hold one of the pink Alexandra roses which had been made a hundred years earlier was all very humbling and hugely inspiring. , I returned home to Ireland with a head full of stories and characters. 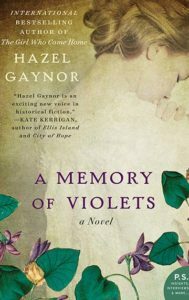 A MEMORY OF VIOLETS was underway. With the exception of Albert Shaw, who was based on John Groom, the remainder of the characters in the novel are fictional. Florrie and Rosie were inspired by the many accounts of street children whose harrowing tales are recorded in Henry Mayhew’s London Labour & The London Poor. The inhabitants of Violet House are drawn from my imagination and from stories told in two fascinating pieces of work: Reminiscences of a Flower Girl and More than One Mountain to Climb. Both of which are written by former flower girls who had lived and worked at John Groom’s Edgeware estate in the 1930s onwards. They provide a fascinating insight to the way these incredible women lived and worked together. Discovering the lives of London’s flower sellers was so fascinating. I hope to have brought these forgotten members of society back out of the history books and to have brought some colour and light to those grainy old photographs we see of Victorian London. "I adored The Cottingley Secret ... Gaynor has penned, in majestic prose, an enchanting and enthralling tale of childhood magic, forgotten dreams, and finding the parts of ourselves we thought were lost forever"
© 2019 · Hazel Gaynor · Lovingly built by Design for Writers.